Everyone knows about stay-cations where, instead of visiting far shores, one visits local attractions. But if you don’t have time off this summer, here’s a suggestion: Try some day-cations. While those who live in Anaheim can spend a day at Disneyland, the Wasatch Front offers more authentic wonders—less crowded, less noisy and way less expensive than the fantasy park, where adult tickets cost $125. Utah’s legendary Wasatch resorts have made an art form of catering to summer visitors. Alta’s Albion Basin in Little Cottonwood Canyon is considered one of the world’s prime wildflower areas, with over 100 varieties of flowers. Albion Basin’s Summer Road opens June 30, with a free shuttle from the main resort parking lot if there’s no room to park at the trailhead. The Alta Lodge offers a special Sunday brunch. Down the road is Snowbird, which is great for both hiking and hooking up with fellow outdoors lovers. Take a tram ride to the top and wander around Hidden Peak ($16 for adults, $14 for kids 7-16, kids 6 and under are free). Get a free tram ride when you eat at one of the six resort restaurants. Or find a new friend while sitting in the plaza and nursing a frosty brew. The plaza area has a selection of rides, including a mechanical bull, “bungee” trampoline, rope course, climbing wall, an “air jumper”—which flings riders through the air over a big inflated base—an alpine slide and a newly furbished zip line that allows riders to load at the base, rather than climbing to the top. Perhaps the best feature is for hikers: access to Mineral Basin via the Peruvian chair lift, with a short trip through the cool, shaded tunnel to the isolated basin. “It’s spectacular scenery. You can’t see anything but wilderness, except for the lift that takes you back up to Hidden Peak,” says Snowbird communications manager Emily Moench. A day pass including all attractions is $42 for adults or children taller than 48 inches; for kids under 48 inches tall, it’s $29. On the other side of the mountain, at the top of Big Cottonwood Canyon, is Brighton. It offers a rustic retreat where you can even catch your own food. Start your day-cation early with an overnight stay at the Brighton Lodge, where you can spend the evening looking up at the stars from the hot tub. The next morning, with fishing pole (and fishing license) in hand, hike up to Lake Mary or take the easy walk down to Silver Lake. Both lakes are so well-stocked, you’ll catch your limit—enough fish for dinner, with some to take home and freeze for later. Park City’s three world-famous resorts are day-cation delights. Canyons Resort starts summer activities June 14. The first of the Summer Concert Series begins July 14, and continues every Saturday until Sept. 1. But the big attraction is the ever-expanding bike park, which is essentially four BMX tracks (one new this year) for mountain bikes. The tracks range from easy to expert, with banked turns, jumps, bridges and other features. A new attraction offered by Canyons Resort this year is a mountain-bike academy with morning and afternoon lessons for all rider levels. Call 888-226-9667 for prices. 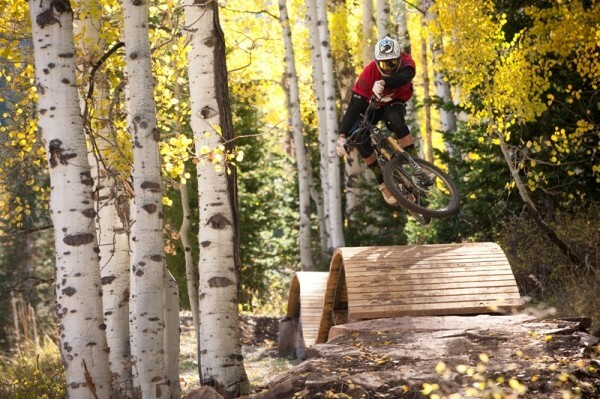 Deer Valley offers the best lift-served mountain biking in Utah, with immaculate trails and a well-deserved reputation for gourmet restaurants and great customer service. A lift ticket for you and your bike is $36. You can also rent one of Deer Valley’s brand-new mountain bikes for $45 for three hours, or $58 for the full day. Bike rentals come with a helmet, pads and gloves. Park City Mountain Resort is a mountain amusement park, with colorful rides for young children, an “Adventure Zone” of climbing attractions for older kids, a dual-track alpine slide where riders can really rip, a zip line and the Alpine Coaster, which winds through the forest while making thrilling hairpin turns. This year, for the first time, Park City Mountain Resort is offering a summer season pass. Pass prices are based on height. For those between 42 and 53 inches tall, a pass is $105. For those 54 inches and taller, the pass is $210. Prices for the “all-in-one” Alpine Pass, which is an all-day pass with unlimited access to all attractions, are $70 for those 54 inches and taller, and $35 for those under 54 inches tall. There are additional fees for the ZipRider ($8 per ride) and the Flying Eagle Zip Line ($5 per ride).